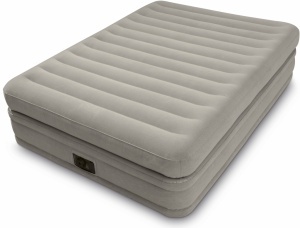 Intex 64446 – Intex Fiber-Tech Queen Size Prime Comfort Raised Airbed with Built-in Electric Pump. The perfect all round sleeping solution with an enhanced soft, fleece flocked top. The double layered construction allows you to tuck sheets in easily and securely. Intex's patented Fiber-Tech interior construction provides superb support and structural stability for a restful nights sleep. For added convenience the powerful built-in pump easily inflates and deflates the airbed in minutes. - Quality tested 21.2 gauge waterproof double patterned flocked top and sides with 15 gauge vinyl bottom. - Mattress is raised 20'' from the floor for convenience. - Mattress approximate maximum dimensions 60'' x 80'' x 20'' .